Prime Minister Gordon Brown has urged postal workers to end strike action over pay and jobs, saying there was "no justification" for them to continue. Most of the strikers returned to work on Wednesday at the end of a second 48-hour walkout in less than a week. But Royal Mail confirmed there had been some unofficial strike action in London and Liverpool. Mr Brown said the dispute "should be brought to an end on the terms that have been offered as soon as possible". Some of the returning workers were outraged to discover that the times of their attendance had been changed without their consent. 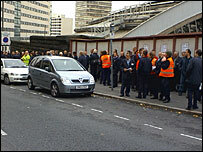 The firm said it was "extremely concerned at the unlawful unofficial strike action taking place at a handful of sites". "Unlawful action is wholly unacceptable and must be condemned by the trade union," a Royal Mail spokesman said. He added: "People at 99% of our workplaces have returned to work as scheduled." But postal workers have criticised the government, the Royal Mail's main shareholder, for not stepping in and helping to resolve the problems at stake. The unofficial stoppage was called at district offices throughout Liverpool and soon spread to the main sorting office at Copperas Hill, while workers at branches in east and south London also walked out. Workers at the Victoria Road office in Glasgow walked out, but later resumed their duties. Royal Mail worker David Wall, a postman with the Walton office in Liverpool, said hundreds of postal workers had gone back to the picket lines to protest against the changes to flexible working hours. These included the end of the freedom to leave early once staff have finished their round. He explained that the wildcat strikes were triggered by new Royal Mail rules, which they had not consented to, that prevented workers from starting work before 0600 BST and leaving before 1415 BST. Historically, most postal workers began their shift between 0500 BST and 0530 BST and were free to go when they had finished their round. Mr Wall argued this loss of flexibility, and not pay, was the reason he was on strike and said that he believed that was the case for most of his Royal Mail colleagues. "The current Royal Mail management introduced this concept of flexibility when they were appointed," said Mr Wall. "Now, they are taking it away, claiming it is because they need to modernise and save money, yet there is no sign that their bonuses have been cut."